32,21 x 28,96 x 8,62 x 4,47 x 3,02 m.
4SA V14 cylinder Alpha type 14T.23L-VO, 225x300; 1 generator 72 kW/380 V/50 Hz; 1 generator 36 kW/380 V/50 Hz. Don't think that I understand the Vigo connection for her owners. The owners from Barcelona had her sailing in Vigo. She was also registered there, so that means they had an office in Vigo. (postoffice?). Unfortunitly it is not visible at the stern of the tug but at th wheelhouse stands Barcelona! The picture was taken in Vigo as been told to me. Henk - these photos were taken in Barcelona. 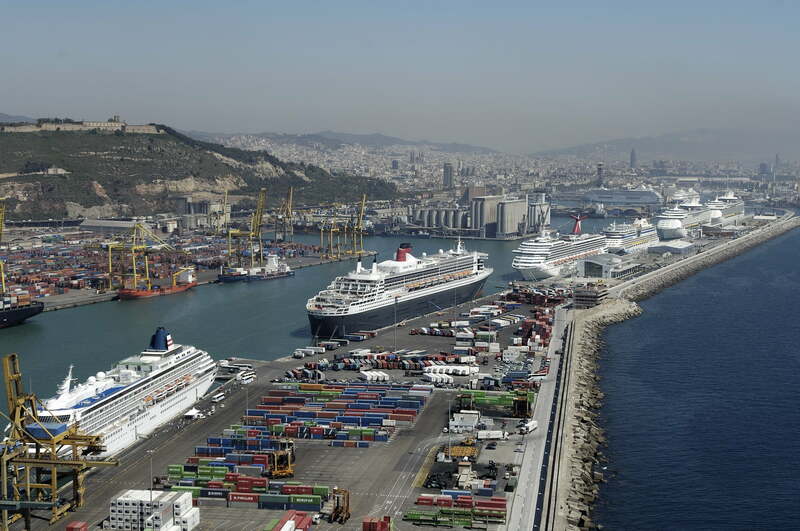 Your top photo (with the port of registry clearly Barcelona) is in front of the corner silos on the right, with the yellow container cranes across the dock. Google maps shows the white petrol tanks in line further back. Whether A GAUDI was previously based in Vigo or was registered there I don't know, though I would doubt it. She may of course have made subsequent visits there in these old colours, as she definitely did much more recently in 8/2009 - she seems to be doing coastal towing since her days at Aviles. Good. What year is that LR? Just need to track down when the changes in registration were. Piet van Damme thinks she changed from Barcelona to Vigo in 1997. At some point she changed back. David. Just checked the Lloyds Registers from 1975/1976 till my last one in 2005/2006 and she was always registered in Vigo. Never found Barcelona! The copy was from 1991/1992. The pictures where taken June 1994. So, that means LR made 10 years long the same mistake. That picture was taken in 1994 and already called Barcelona (at the wheelhouse OK) but mentioned it! Who can make a happy end to this story? Possible that LR had it wrong from the beginning, but if nobody ever told them it would stay the same. But more likely that she started as registered in Vigo and LR never informed of change. We need some more expert Spanish help, I think! Registration number pre-1995 would be helpful. No registration number is called before 1995 David. Not in Lloyds.